Climbing the Date Palm is out in paperback on Amazon, finally. or if you are so inclined, you can also get it from Wild Iris Books, our local feminist bookstore/LGBTQ+ safe space. Aviva was not surprised, only annoyed, when a strange horse interrupted her walk home from Market and tried to nose its greedy way into her purchased bag of malabar spinach; the surprise came a moment later when she realized that sprawled across its back was a very attractive, well-dressed young man who seemed near death. 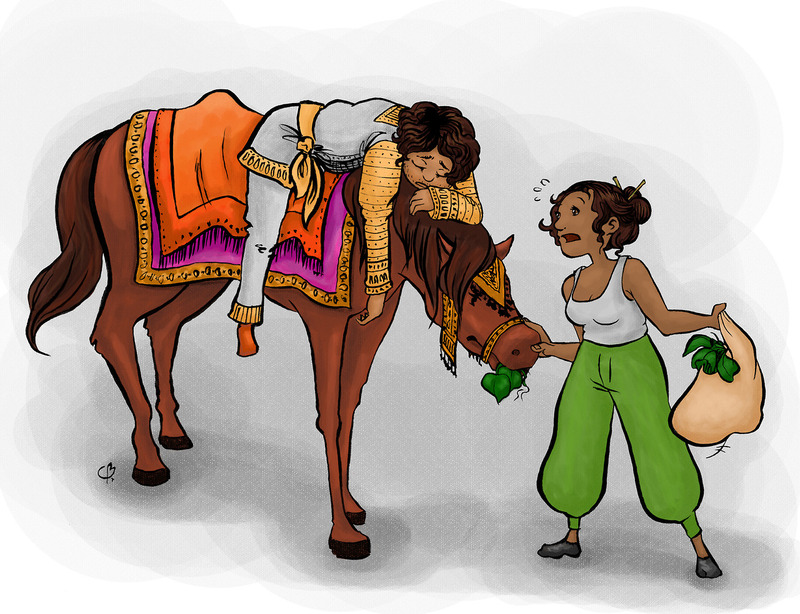 This entry was posted in Mangoverse and tagged adventure, books, cartoon, diversity, f/f, fairy tales, fantasy, farmers-market, femslash, glbt, horse, lgbt, lgbtq, m/m, malabar, malabar spinach, new adult, queer, queer books, queer lit, representation, slash. Bookmark the permalink. I assume they’ll ship anywhere you’re willing to pay shipping. You may as well know now since you’re a Prizm author, too: they instruct international customers to just leave “US” as the country and continue with the buying process. Everyone who I’ve told that to has it work just fine. You’re going to have to tell your own customers that starting in January, so… yeah. But as for Wild Iris, I’ll see if I can’t get one of the owners to answer that for you on this page. Thanks for your persistence! Thank you. That will definitely be helpful as I mostly know Canadians! Haha, well thank you for writing a book that I’m hyped about! But yes, I’ll hold off a little to see if Wild Iris will do that! Wild Iris can ship internationally! We may have to work the deal through paypal but you can also email us info-at-wildirisbooks-dot-com and we can send out a paypal invoice to you!